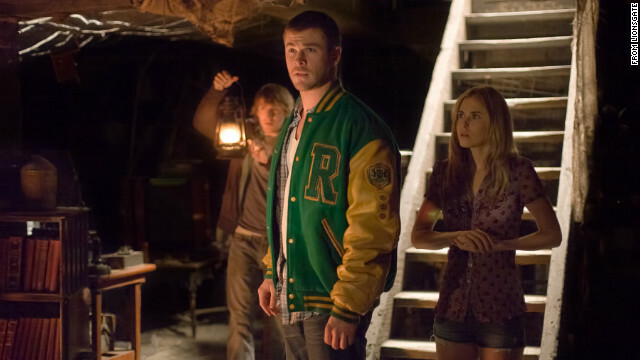 Fran Kranz, from left, Chris Hemsworth and Anna Hutchison star in "The Cabin in the Woods," which opens Friday. When "Firefly" and "Buffy the Vampire Slayer" creator Joss Whedon introduced the film "The Cabin in the Woods" last month at the South by Southwest Film Festival in Austin, Texas, he told the audience, "I hope you enjoy it, and then sorta keep it to yourself." Whedon, the film's writer and producer, really meant it. He even recorded a video plea asking fans who saw the horror film not to give away any of the major plot points online. It's no secret that the film, long awaited by Whedon fans, doesn't really take place in a cabin in the woods. The trailer points out that a group of college kids only think they're spending a weekend in what is actually a controlled environment. Beyond that, however, fans who have seen the movie already are expected to stay mum on what happens, to avoid ruining it for those who have yet to see the movie, which hits theaters Friday. The spoiler culture, of course, has been around at least since the dawn of the Internet, and directors have long been asking audiences not to give away surprises, most famously since Alfred Hitchcock and "Psycho." But there now seems to be a renewed focus - especially with the advent of social media - on making sure that fans don't say too much. "The Walking Dead" executive producer Glen Mazzara recently told reporters about a "security task force," led by producer Gale Ann Hurd, creator Robert Kirkman and "computer savvy" Scott Kimple. Their job is to make sure leaks about the show's many secrets don't appear online. "AMC takes this stuff very seriously," Mazzara said. "And we try to see where leaks are coming from and if they're accurate or they're not and then trying to get stuff taken down and it's really like trying to sweep back the ocean." Fran Kranz, who plays Marty in "The Cabin in the Woods," said he can understand some fans' desire to find out as much as they can about a film or TV series. “I’m a big fan of horror films, and I want to know about all kinds of movies, and I totally get it," he told CNN. "I find when I meet a fan of Joss’, I’m just as excited about his work as they are. I’ll be first in line to see (Whedon's) ‘The Avengers.' "